While neutral color schemes inspired by Scandinavian décor are a big thing, beautifying your home with splashy hues are now on trend. But if you are not sure how to add pops of color to your space you came to the right place. The following ideas share tricks and ideas for reinvigorating your décor with a rainbow of hues. Dipping your toe into a sea of color for the first time at home can be intimidating. That is why we think the easiest way to get started is by adding a bright hue or two to the smallest spot in your abode. Illustrating our point are the pint-size bathrooms in this New York City apartment remodeled by Studio DB. The cheerful spaces combine graphic tile with fixtures and accessories in electrifying shades of yellow, pink and red. If your minimalistic side is not onboard with bright, crayon-like colors, consider mixing things up with abstract prints and sophisticated shades. A pale blue sofa anchors this bohemian-inspired living room by Logan Killen Interiors. Pillows and two Memphis print chairs spice things up with soft hues and colorful patterns. Jewel-toned furniture adds cozy glamour to this quirky and chic living room by iconic interior designer Miles Redd. The ultra violet sofa anchors the space with bold color while both the lemon yellow and apple green chairs bring balance. Ceramic side tables in turquoise contribute to the room's symmetry. Butterfly wallpaper, an upholstered stool from Home Goods, Ikat print pillows and an embroidered quilt from Anthropologie are the things that colorize this otherwise white bedroom in a home remodeled by French and French Interiors. A moody shade of teal paint and an exuberant Turkish rug are the key ingredients that give this living room by Zoë Feldman its dramatic aesthetic. Mustard yellow décor brightens up this modern farmhouse-inspired home remodeled by Lucy and Company. We love how the hue can instantly refresh a space dominated by woodsy shades. To be honest, we love bright hues and exotic patterns. So, of course, we fell head over heels when we spotted this living room by Alida and Miller. Here colorful textiles from around the globe warm up the bohemian inspired space with downright funky style. A horse painting picked up at a local thrift shop is a nod to 1970s counterculture. Quirky accessories like the decorative swans on the floor and the phrenology head on the end table are right at home in this unique space. Godrich Interiors used colorful, floral curtains to brighten up a family den dominated by neutral furnishings. An abstract painting over the desk adds to the array of kaleidoscopic hues. Interior designer Zoë Feldman used pops of blue, green and purple to transform a basic living room into a colorful oasis. Several different decorative accents in purple unify the space. The color blue is the primary hue in this vintage trailer customized by interior designer Megan Georgopoulos. Navy ceilings and colorful accessories handcrafted by local artisans personalize the space. We adore the daybeds because they are perfect for both sleeping and lounging. Capping off the cork flooring is a small, hand-dyed flokati rug. The New Design Project gives a traditional living room a colorful lift with two pieces of furniture. The acrylic coffee table perks things up with a shock of pink. The apple green wingback chair is a wink to classic décor. A jewel box size space becomes a dramatic winter, sitting room in an abode remodeled by The Vawdrey House. Here navy walls surround a yellow and pink and sitting area. In this Santa Fe, New Mexico home, French and French Interiors combined myriad fabric with vibrant patterns to create this eclectic room. A striped runner on the table pulls together all the colors used in the space. A one of a kind feature wall dripping with colorful texture makes a splashy statement in a home remodeled by Black Lacquer Design. Sometimes all you need is a single bold shade to shake things up. Interior designer Peter Fehrentz installed a set of shocking pink cabinets in this Berlin bachelor pad. Yellow curtains and a pair of turquoise armchairs add vigor and fizz to a midcentury-inspired living room spotted on Sarah Wittenbraker Interiors. A new backsplash can add a little zest to a white kitchen. French and French Interiors enlivened this space with colorful Spanish tile. The yellow bar stools complete the fresh, lemony look. From pale periwinkle to coral pink, most of the pretty colors seen throughout this living room by Affordable Interior Design, repeat in the floral, pattern area rug that anchors the space. The design team at Abaca Interiors warmed up this white bedroom with peppy wallpaper. The gold accent pillow and chevron table lamps add a little extra zing. The inspiration for this tiny, powder room remodeled by Vidal Design Collaborative was the tree canopy over the home. The lively wallpaper captures the whimsical spirit of a storybook forest. Mint green and harvest gold are an unlikely color combination that works in this cute kitchen by Marion Alberge. The painting above the table helps to harmonize the hues. The purple flowers and copper pendant light both add a bit of contrast that boosts visual interest. Just like white spaces, black walls are the perfect backdrop for vibrant colors. In this Austin, Texas home decorated by Sarah Wittenbraker Interiors, cheerful décor in flashy hues soften the edgy, dark walls. A colorful, oversized painting by Roy Lichtenstein anchors the living room in a chic, beach house by Nexus Designs. On the coffee table is a Jeff Koons Balloon Dog in orange. In the corner on the left is a yellow bar cart by Room and Board. Can't afford any of these pricey things? No worries! You can find a broad range of repros and knockoffs online. Pink, purple and green take the helm in this multihued living space designed by Liz Caan and Company. Covering the walls is wallpaper by Phillip Jeffries called What a Gem Orchid. The Ikat inspired pillows are by Osborne and Little. Our favorite feature is the trellis patterned rug by Stark. Jazzing up a plain, white interior is a cinch with polka dot wall decals. This children's bedroom in a Westport, CT home by Chango and Company looks like it was sprinkled with colorful confetti. Millennial pink is hardly over — In fact, many interior designers say the super favorite shade is here to stay. In this light and airy entryway by interior designer, Linda Cava the cute color lightens up the clunky, wood furniture. The backbone of this colorful living room by Emily Lister Interiors is the eye-popping feature wall. Blue armchairs, a Moroccan inspired orange rug, and colorful pillows turn up the intense hues. A grown up's bedroom by Studio Stamp is tricked out with candy-inspired hues. Anchoring the space is a turquoise, Seahorse headboard by Serena Lily. Colorful bedding including the pillows pull together all the other yummy shades illuminating the room. While some folks believe diamonds are a lady's best friend, we prefer colorful gemstones particularly when it comes to multihued interiors. Here gorgeous jewel tones including sapphire blue, canary yellow, and fancy fuchsia put the opulence in this living room by Toronto Interior Design Group. Are you looking for a simple and cute way to brighten things up? These color dipped stools in a Brooklyn kitchen by interior designer Linda Cava bring a surprising splash of red color to the table. The right quilt can instantly refresh your space. Here the interior designers at Studio Stamp renew a white space with colorful linens. The DIY artwork over the headboard matches all the hues on the bedspread. Energize your current color scheme by removing the dust jackets from your old hardcovers. Interior designer Erica Burns turned a home library into a focal point by organizing the books by color. If you are looking for an on-trend shade that will revive your décor, consider ultra violet, Pantone's color of the year for 2018. The robust hue works with both warm and cool tones, and as shown in this space decorated by The English Room, the shade pairs exceptionally well with emerald green. Notice the two DIY striped paintings on the wall? They unite all the colors used throughout the room. When it comes to interior design, black is the new white. In this small, sun-drenched living room by Sally Wheat Interiors matte black walls puts the focus on colorful décor. You can make a small room feel more spacious with a moody paint color. The trick is using a glossy paint that reflects light. 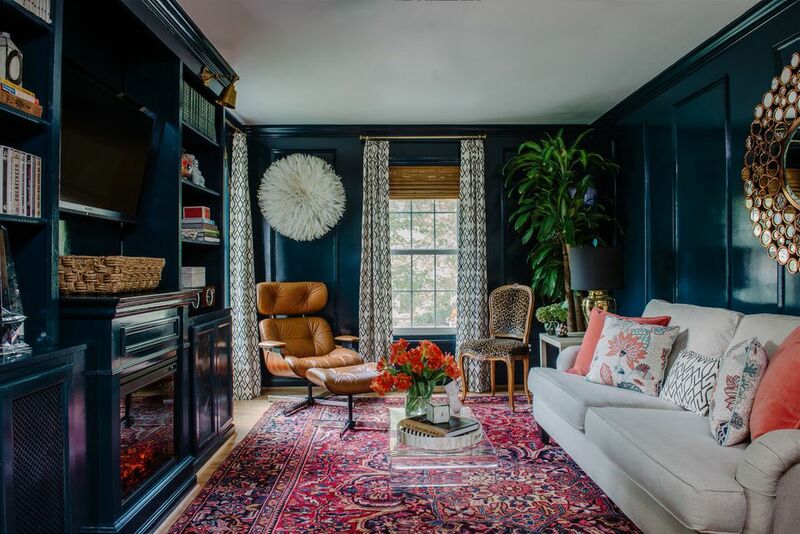 In this anti-minimalist room by Alison Giese Interiors, lacquered navy walls set the stage for a mix of colorful furnishings. Painting the ceiling white enhances the sense of roominess.